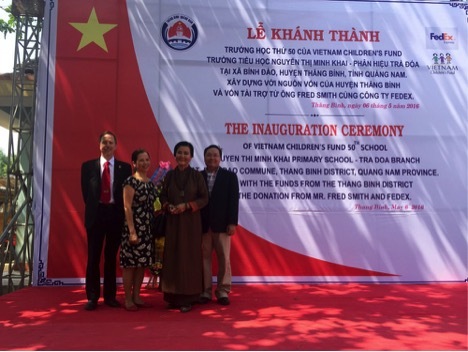 With President Obama visiting Vietnam, it is now time for a celebration of a very successful bipartisan pro-bono effort to help build elementary schools in Vietnam. The late Jack Wheeler upon hearing of Lew Puller Jr ‘s tragic suicide challenged us all to build enough schools to honor all the names on The Vietnam Veteran Memorial. Now with the 50th School built that quest has been doubled. And the year end letter for 2015 captures the sense of progress. The close of the year always seems to be a time of reflection for me. The first thing I think of is the gratitude we feel for the support we have from those who care about our work – building clean modern schools for children who live in some of the most deprived regions of Vietnam. We have finished the renovation of Lew’s school, thanks to the generosity of Mr. H.F. Lenfest of Pennsylvania. Last spring President Truong Tan Sang conferred the Friendship Medal on Sam in recognition of the important contributions he has made for the past two decades in his work with VCF. This Medal is the highest honor accorded by the Government of Vietnam to non-citizens. In June an elaborate new playground was installed at the award winning school in Thai Binh, a generous gift from Mr. Binh Tran of Washington, DC. We are working now on the new school in Quang Nam, sponsored by FedEX which will be number 50! And a school in Ha Giang, sponsored by Mr. and Mrs. Pat Lomma, our 51st! 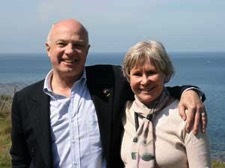 We remain deeply grateful to all those who have supported our work over the years. Your gifts, large and small, have made it possible to change the lives of more than 100,000 children. Many have gone on to secondary education and beyond. There are no words to express our appreciation. If you are moved to give VCF a gift our mailing address remains PO Box 150, Unionville, VA.
Wishing you and yours the very Best of the Holiday season and beyond. The above letter written by the two distinguished co-chairs of the Vietnam Children’s Fund , Terry Anderson and Kieu Chinh and perfectly captures the success of a project that began two decades ago. Since the letter the 50th School was dedicated thanks to the generosity of FedEx a company created by a decorated Vietnam veteran Fred Smith. This is a picture of the famously talented actress Kieu Chinh and the VFC project manager Sam Russell who was awarded the Vietnam Friendship Medal, the highest award bestowed on non-citizens. L-R Sam Russell, Lan Vien, Board members Kieu Chinh and Binh Nguyen. With the 50th school having been built, it is time to reflect on all who made this worthy effort possible. Two decades ago group of friends got together at the Freedom Forum in the old Arlington USA Today headquarters to launch an effort to build a school in Vietnam in honor of the late Lew Puller. Today his legacy is very much alive with the children of Vietnam. The Vietnam Children’s Fund was the dream of Lewis B. Puller, Jr. who lost both legs and most of both hands to a land mine during the Vietnam War. Lew was awarded two Purple Hearts and a Silver Star while serving as a Marine Lieutenant. 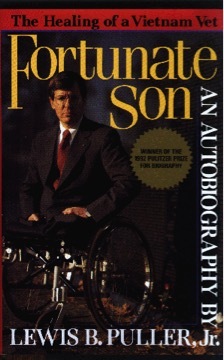 His personal experience, expressed in his Pulitzer Prize-winning book, Fortunate Son, led him to believe that in war no one goes unscathed, and that children, the most vulnerable of all, suffer the greatest hardships. In the year before his death, Lew Puller returned to Vietnam seeking ideas for the living memorial he and several friends had decided to build to honor the Vietnamese men, women, and children who died in that country’s long wars. He decided that the most appropriate monument to the past and greatest hope for the future would be schools for Vietnam’s children. 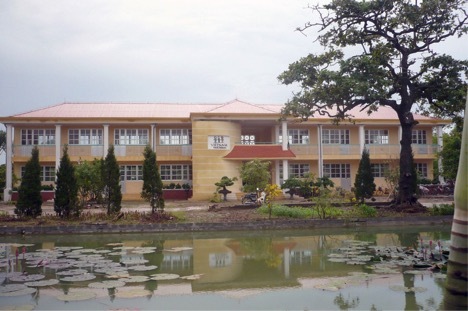 Lew died just before the ground-breaking of the first school, built in Quang Tri Province on the old demilitarized zone and dedicated in his name on the 20th anniversary of the end of the Vietnam War. Since Lew’s death, his friends have remained determined to realize his dream. 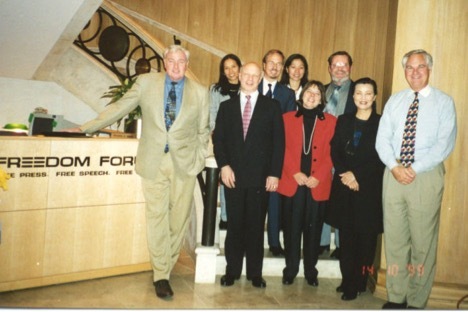 Ed Tumperlake, Lan Vien Jack Wheeler, Sam Russell, Kim Anh, Marcia Landau, Terry Anderson, Kieu Chin, and Tony Accamando Board members not seen in the photo are Joy Carroll and the Honorable Pat Derian. During the journey to the 5th School many were very helpful especially the late Al Neuharth, and the late David Broder of The Washington Post. Mr. Neuharth sponsored the original meeting space and David Broder’s column, very early in the effort, about honoring Lew was so very important. “The project is an inspiring example of how people of goodwill can turn violence and tragedy into a cause for hope.”-David Broder, The Washington Post. Jack Wheeler was brutally murdered in 2011 and the crime remains unsolved. Jim Kimsey who donated the seed money to build the first school. 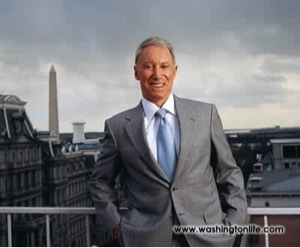 Board Member Tom Kennedy who left us all to soon. Tom was passionate about and dedicated to the Vietnamese children. Over the years he raised hundreds of thousands of dollars for VCF. His family and friends personally funded the construction of two schools: one in Phu Da and one in Que Son, the home village of his adopted son Khoa. The sounds of a distant battlefield are echoing into history but the sounds of Vietnamese children attending VCF schools will be with many generations yet to come.